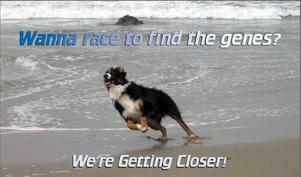 “There has been a significant breakthrough in our Australian Shepherd epilepsy research! The SNP (genetic marker) analysis has indicated an area on one chromosome that appears very likely to contain a significant epilepsy gene. As our current Canine Health Foundation grant is ending, we will be applying for another grant from the AKC Canine Health Foundation to continue this work to further examine this area, and try to find a gene causing or contributing to AS epilepsy. We urge AS owners to continue their support of this very important health research. We need more samples from affected dogs as well as from dogs over 10 years old who have never had a seizure of any kind”. Dr. Patterson urges us to continue to support the research. Dr. Patterson has applied to CHF for another grant. We must be ready with funds to help sponsor the next grant so we can move forward with this “significant breakthrough in our Australian Shepherd epilepsy research!” Please continue to stand with us by sending in a donation and/or raising funds for us to support the research. Any amount is needed and much appreciated. Please see below for information on making a tax deductible donation. Dr. Patterson also mentions the need for more samples from affected dogs. If you have not already sent in a blood sample from your affected dog please help the researchers by sending it in. All information is kept confidential by them. Please submit a blood sample. If you have any questions or need help in sending in a blood sample from your dog please contact us. Thank you to everyone that has given a blood sample and sent in a donation. Blood samples and funds are what the researchers need to keep going. Our efforts are paying off! Thank you for your help in the fight against canine epilepsy. Please see our current ad on facebook and in the Australian Shepherd Journal and Aussie Times for May/June 2011… our 1 ½ year old Aussie “Billy” is keeping up the family tradition of supporting canine epilepsy research.